With Series 2 of Downton Abbey just days away (finally – our countdown is in single digits! ), it seemed worthwhile to think about what the ideal new season would look like. There are so many plot points from Series 1 to deal with – not to mention that pesky World War – that anything can happen. So, click through for my personal wish list of what I’d like to see the most in Downton Series 2. This list is completely spoiler-free (I stayed away from the one topic that I’ve seen spoilers for, as I figured it wasn’t fair to come up with predictions influenced by things that I knew would actually happen! ), so feel free to take a read through and tell us what you’d most like to see in Downton’s new episodes in the comments. Ahem so, in no particular order, here the things that I’d be over the moon to see in this new series of Downton. While it’s doubtful all of these would/could ever come true, maybe a few will happen! More Maggie Smith! Smith’s Dowager Countess was certainly one of the more memorable things about the first season of Downton for a variety of reasons, not the least of which being her sarcastic commentary, well-timed eye rolls and general ignorance of weekends. But, one of the best things we saw about her character in the first series – and something that really should be fleshed out further at some point – is that Violet is a pretty awesome person. Sure, she’s snobby and elitist and entitled, but she’s also frighteningly loyal to people she cares about and probably one of the few characters in the series to experience growth over the first season. Don’t we all love the moment that she alters the flower show judging results to give William Molesley the win? Don’t we all want to cheer for her when she apologizes to Cora and admits that she’s done her best to try and minimize the scandal for Mary stemming from the Mr. Pamuk incident? Admit it – when she says that Mary holds the trump card because she’s family, we maybe all sort of wished that Violet was our grandmother too. In Series 2, I certainly want the Dowager Countess to continue to her tradition of being the wittiest character on television, but I’d like to see more about her as a character, be it in the form of backstory or more of her growing pseudo-feminist-in-some-small-way (though I imagine she would hate that phrase) leanings. Romance for Bates and Anna! While the Matthew and Mary relationship is the central love story in Downton Abbey, for me, Bates and Anna’s quiet romance is the most appealing. Bates decent character, strong morality and obvious feelings for Anna despite his insistence that they can’t be together, is swoon-worthy. Her unshakeable belief in him is incredibly touching. In other words, they are basically the definition of adorable. Though I never seem to get what I want when it comes to romantic relationships on shows like this, if these two crazy kids don’t actually manage to get together this season, I’m going to be heartbroken. The two of them deserve some happiness together, especially Bates after everything he went through last season. Consequences for Some of Our Less Favorite Characters. Though Thomas escaped a much-deserved firing over his horrible actions in Season 1 by virtue of enlisting in the Army, at least we did get to see everyone figure out what a vile person he was, even if we couldn’t watch him be formally tossed out of Downton for being a lying liar who lies. (I’ll be curious to see where his storyline goes after this, to be honest, and hope that his past isn’t whitewashed or forgotten.) In this upcoming season, it would be great to see some of the other less-than-admirable characters face some consequences for their actions. For example, we see that O’Brien does have some form of conscience at the very end of last season, and it’s likely that she feels terrible about Lady Grantham’s miscarriage, but in order to take her seriously as more than a one-dimensional villain, we need to see her punished for her actions in some way. Even if this “punishment” something as small as someone other than Thomas finding out all the shenanigans she’s been engaged in, it would at least show the audience that she’s not getting away scott free with everything and make her change of heart (if that is indeed what’s coming) more believable. And what of Lady Edith? Granted, her nastiness levels aren’t quite on par with O’Brien or Thomas, but what further ramifications might we see from her letter to the Turkish ambassador and attempt to destroy her sister’s reputation? The argument can be made that Edith has been punished enough already, what with Mary ruining her engagement prospects and everything, but it still might be interesting to see what would happen if Lady Grantham or the Dowager Countess were to learn exactly how the Turkish ambassador got hold of his information. Stop the Merry-Go-Round, Matthew and Mary. Hopefully in Series 2, we’ll finally see Mary and Matthew commit to each other, preferably with both of them deciding to do so at the same time. As viewers, we almost always love a tortured romance – and these two have that in spades – but I question how long we’ll be willing to wait for these two to sort themselves out, when there’s little reason preventing them being together, other than Mary ‘s strange stubbornness. Would it not be almost a better story if she were to tell him about the Mr. Pamuk situation and have that be the thing that divides them (until Matthew realizes that he forgives her of course), rather than her sudden reluctance to say yes to him, despite their obvious feelings for one another. And of course now poor Matthew assumes her interest was all about his prospects instead of himself. Should have listened to your grandmother, Mary! Though it took me ages to warm up to this pairing I, I am firmly in their corner now (Mary is occasionally a hard person to like), and while I love the heartbroken staring as much as the next girl, I would desperately like them to either accept and act on their feelings in Series 2 or for a more compelling reason to keep them apart. Though the war might be reason enough for their separation in and of itself, so we’ll have to see. More backstory for everyone! 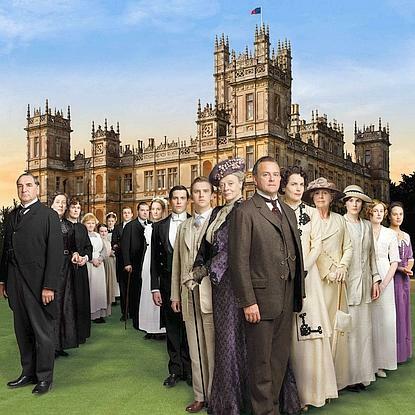 Am I the only person who is dying to know more about the history of Downton? Wouldn’t it be neat to find out more about the estate when Violet was the Lady Grantham in charge? We’ve seen some interesting backstory so far for several of the servants – Carson, Mrs. Hughes, Bates to some extent, though there’s probably more to come on that front. How did Mrs. Padmore come to Downton? What about Anna? And though we’ve seen their relationship now, it would also be interesting to learn more about the early days of Lord and Lady Grantham’s marriage, especially given that Cora is a foreigner and would have been very ignorant of the way things are done at a house like Downton. There’s such a big cast of characters that there’s got to be great stories to tell about them and what makes them who they are that we just haven’t seen yet. Honorable mention list: More focus on how Sybil's political leanings clash with her family, hopefully the war will make Mary a bit less self absorbed, and maybe Daisy will be allowed to do something other than look flustered and get yelled at by Mrs. Padmore. Anyone else have any plots or characters they feel are musts for Series 2? Share your thoughts in the comments!